We’d love your help. Let us know what’s wrong with this preview of Lark & Termite by Jayne Anne Phillips. A rich, wonderfully alive novel from one of our most admired and best-loved writers, her first book in nine years. Lark and Termite is set during the 1950s in West Virginia and Korea. It is a story of the power of loss and love, the echoing ramifications of war, family secrets, dreams and ghosts, and the unseen, almost magical bonds that unite and sustain us. At its center, A rich, wonderfully alive novel from one of our most admired and best-loved writers, her first book in nine years. Lark and Termite is set during the 1950s in West Virginia and Korea. It is a story of the power of loss and love, the echoing ramifications of war, family secrets, dreams and ghosts, and the unseen, almost magical bonds that unite and sustain us. At its center, two children: Lark, on the verge of adulthood, and her brother, Termite, a child unable to walk and talk but filled with radiance. Around them, their mother, Lola, a haunting but absent presence; their aunt Nonie, a matronly, vibrant woman in her fifties, who raises them; and Termite's father, Corporal Robert Leavitt, who finds himself caught up in the chaotic early months of the Korean War. To ask other readers questions about Lark & Termite, please sign up. As I neared the end, I found that the pace of my reading had slowed down; I didn't want the book to end; I didn't want to leave these characters or this writing. Phillips writes like a dream, as the expression goes. I thought the chapters 'narrated' by Termite (a boy who can't talk or walk) especially fine. At first, I thought of Benjy in The Sound and the Fury, but make no mistake about it, Termite is Phillips' own character and needs no comparison to any other. At times, Lark's voice reminded me of the main character in Anthropology of an American Girl, and that is a compliment to both writers. The novel alternates (mostly) between the 1950 No Gun Ri Massacre (during the early days of the Korean War) and 1959 Winfield, West Virginia. The allusive and illusory parallels between the two places and the characters involved become obvious (though never artless) as you read on. Even so, there was still the mild shock of a 'surprise,' for me at least, when I discovered in the last chapter what one of the 'symbols' was all about. What's going on here? Even though the reader can tell he's in the hands of a gifted novelist, especially if he has previous Jayne Anne Phillips experience, he might ask this question before allowimg himself to sink into her narrative, confident she'll get him to the end safely and satisfactorily. And she does. 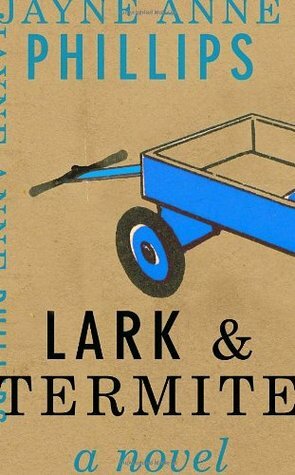 Lark and Termite is a novel told in 2 narrative threads. There's a thread beginning July 26, 1950 in which a U. S. Army soldier fighting in Korea, his unit retreating before the overwhelmin What's going on here? Even though the reader can tell he's in the hands of a gifted novelist, especially if he has previous Jayne Anne Phillips experience, he might ask this question before allowimg himself to sink into her narrative, confident she'll get him to the end safely and satisfactorily. And she does. Lark and Termite is a novel told in 2 narrative threads. There's a thread beginning July 26, 1950 in which a U. S. Army soldier fighting in Korea, his unit retreating before the overwhelming North Korean attack, encounters a group of refugees and tries to protect them. The 2d thread occurs over the same few July days nine years later. It relates the lives of the siblings Lark and Termite and several adults in Winfield, West Virginia. Once the reader becomes aware of the 2 distinct threads and the themes they share, he knows the author will bring everything together into a point to stab and stir the mind. I could not have predicted the third thread with which she neatly wraps her package. The additional elements put one more puff of wonder into a novel already ballooning with wonder. Phillips, in her earlier novels, writes of strong sister/brother bonds. Here's another. Termite, though disabled, damaged, and deficient, shares traits of other brothers Phillips has written in that he seems to be a kind of nature boy possessing primal intelligence or awareness. The sections told from his point of view show him to be a kind of wormhole allowing the different parts of the novel to flow into each other. Lark, his caring 17-year-old sister, is mostly woman, maybe goddess herself or maybe just votary, but easy to feel affection for. They're wonderfully realized characters. In the Korean thread I detected a clumsiness in Phillips. She seems less comfortable with Robert Leavitt at the opening of the Korean War. It may be an unfamiliarity with place and writing about military action. To me she seems a little out of step. I did wonder if her wrongfootedness isn't so much failures of research or confidence as it is convenient arrangement to allow the fit of parallels and metaphor. I usually scorch with scorn the supernatural in fiction. I'm not much interested in magic realism anymore. When I drive through West Virginia I don't see evidence of it, at least not on the route I take. But Phillips has found it there and shown it to us in ways to make the heart swell with wonder and gratitude. I call it magic realism to give the author the benefit of the labeling doubt. Realizing there was an air of mystery about the events that the characters didn't quite understand but accepted, I didn't mind it. And I didn't quite understand all of it, either, especially the angelic purpose of one character who comes bringing gifts and storms. This is the kind of book in which I tend to completely immerse myself. I was moved on so many levels. Two stories run side by side - a corporal trapped in a tunnel in Korea, and the story of Lark, a young girl coming of age, taking care of her half-brother, the corporal's son, in a West Virginia town way past its hey day. Termite is special with disabilities but also with the acute ability to see and hear in a different way. As the reader enters the hearts and minds of each character it is oh so This is the kind of book in which I tend to completely immerse myself. I was moved on so many levels. Two stories run side by side - a corporal trapped in a tunnel in Korea, and the story of Lark, a young girl coming of age, taking care of her half-brother, the corporal's son, in a West Virginia town way past its hey day. Termite is special with disabilities but also with the acute ability to see and hear in a different way. As the reader enters the hearts and minds of each character it is oh so easy to get swept up into their lives. Phillips prose is gorgeous and poetic and there is a tenderness here that makes you cry. It's not hard for me to understand why this novel especially touched me; Lark is the same age I was back in those days and I lost a most beloved uncle in the Korean 'conflict.' (It was a war, no mistake about it.) The background of No Gun Ri in the corporal's story is a sad but interesting one with several different views as to what really happened there. I became politicized by this war as a young girl and it informs to this day of who I am. Amerikkalaisen Jayne Anne Phillipsin Kiuru ja Termiitti nousi lukulistalleni blogiystävän suosittelemana. Luin kirjailijan Suojelus teoksen viime vuonna ja Leena Lumi suositteli silloin minulle tätä toista kirjailijan teosta. Nämä kaksi teosta ovat aihepiiriltään erilaisia, mutta molemmissa on kirjailijalle tyypillinen maagisen runollinen ääni, johon liittyy psykologinen jännitys, odotus, intohimon herääminen ja ihastuminen. Molemmissa kirjoissa yksi päähenkilöistä on pieni poika. Termiitti on p Amerikkalaisen Jayne Anne Phillipsin Kiuru ja Termiitti nousi lukulistalleni blogiystävän suosittelemana. Luin kirjailijan Suojelus teoksen viime vuonna ja Leena Lumi suositteli silloin minulle tätä toista kirjailijan teosta. Nämä kaksi teosta ovat aihepiiriltään erilaisia, mutta molemmissa on kirjailijalle tyypillinen maagisen runollinen ääni, johon liittyy psykologinen jännitys, odotus, intohimon herääminen ja ihastuminen. Molemmissa kirjoissa yksi päähenkilöistä on pieni poika. Termiitti on puhumaton ja liikkumaton poika. Toinen päähenkilöistä on hänen melkein 18v. isosiskonsa Kiuru, joka hoitaa ja rakastaa Termiittiä valtavan paljon. Kirjan kertojina toimivat myös Termiitin nuori isä ja molempien lasten täti Nonni. On vuosi 1950 ja 21-vuotias korpraali Robert Leavitt on keskellä Korean sotaa. Hän ei pelkää omasta puolestaan, vaan on jännittynyt vaimonsa Lolan synnytyksen johdosta, sillä synnytykseen on lyhyt aika. Tilanne Etelä-Koreassa on järisyttävän dramaattinen. Vuonna 1959 Länsi-Virginiassa Kiuru hoitaa Termiittiä, ja on samalla jokaisen lähiseudun miehen intohimon kohteena. Pienellä paikkakunnalla jokainen tuntee toisensa, joten kiihkeä ja kaunis Lola, lasten muualle muuttanut äiti, on vielä kaikkien muistissa ja tiedossa. Jayne Anne Phillipsin Kiuru ja Termiitti koskettaa aihepiiriltään, se koskettaa henkilöidensä puolesta, se koskettaa tarinallaan ja luo maagisen ja lukumuistoihin jäävän kirjan, joka sisältää omanlaatuisen maailman, joka voisi olla niin totta. Let me start by saying that this is one of those times when I dislike assigning star ratings to reviews. That being said, and this being a non-professional, completely consumer review, I had to give it two stars. This book, as the title of this review suggests, was not my cup of tea; however, I would not encourage people to shy away from this book. In fact, once it is published and released, I intend to recommend it to my mother. I was unable to finish this book. I got about a third of the way through it before I stopped. When I ordered this book through the Amazon Vine Program, I was expecting to be enthralled by the characters and looking to see how they developed and engaged in the interesting situations/character traits they were presented/had. In good consciousness, I can see how others would enjoy this story and these characters; but, since I do not normally read this style of book, it was not for me. I had difficulty caring about the characters, and was frustrated by the story that was developing and the characterizations created. The plot line is somewhat interesting, but not enough to grab me for an extended period of time. Again, do not take this two star review as the gospel saying "do not read this book;" rather, take it as I did not enjoy it, but you might. As I said, I will recommend this book to my mother and some of my colleagues, who I'm sure would give it much higher reviews than I did. I would normally give a book I cannot finish one star, but since I can clearly see the appeal for others and there are redeeming things about this book, I gave it two stars. This was on the library's new book shelf and had endorsement quotes from interesting contemporary authors (though the Junot Diaz one gave me pause, considering how I felt about the excessive hipsterness of Oscar Wao) so I picked it up. Ultimately, the author tried to take on too much and ended up with a mediocre result. Challenging elements: period piece set in the 50s, dying man narrative, profoundly autistic (or otherwise locked in) character with first person passages, and the supernatural . T This was on the library's new book shelf and had endorsement quotes from interesting contemporary authors (though the Junot Diaz one gave me pause, considering how I felt about the excessive hipsterness of Oscar Wao) so I picked it up. Ultimately, the author tried to take on too much and ended up with a mediocre result. Challenging elements: period piece set in the 50s, dying man narrative, profoundly autistic (or otherwise locked in) character with first person passages, and the supernatural . The period piece element was pretty much not present except that Lark was taking typing lessons. Everything else that should have played in--the social mores of the time, fashion, etc.--fell by the wayside. I can't even say there was a half-hearted effort to capture small town life in the 50s. The experience of dying...eh, I'll give her a pass. I've never died. I don't expect it to be so profound, though. The autistic character's first person narratives were ok as far as that sort of stream-of-consciousness thing goes (not my thing but I can appreciate it), but the lucid exposition within them was pretty transparent. The supernatural element was a complete non-sequitor and did not fit in with the rest of the writing/story. I read this for a book club that never ended up meeting. So I SHOULD be frustrated that I read it for nothing. But. I am not. Because if I had not been reading it for a book club, I likely would have thrown it against a wall 30 pages in and said "i give up! shifting perspectives, a mentally challenged youth, and endless scenes in a korean tunnel. who cares!?" but instead, i powered forward, thinking if i didn't finish it, book club would mock me. and i am glad i did. because the last third of th I read this for a book club that never ended up meeting. So I SHOULD be frustrated that I read it for nothing. But. I am not. Because if I had not been reading it for a book club, I likely would have thrown it against a wall 30 pages in and said "i give up! shifting perspectives, a mentally challenged youth, and endless scenes in a korean tunnel. who cares!?" There are books you recommend to everybody, and then there are books you share cautiously, even protectively. Jayne Anne Phillips's "Lark and Termite" is that second kind, a mysterious, affecting novel you'll want to talk about only with others who have fallen under its spell. On the surface, nothing about the West Virginia family in "Lark and Termite" seems especially noteworthy, except perhaps the consistency of their misfortune, but the author reveals their tangled secrets in such a profound There are books you recommend to everybody, and then there are books you share cautiously, even protectively. Jayne Anne Phillips's "Lark and Termite" is that second kind, a mysterious, affecting novel you'll want to talk about only with others who have fallen under its spell. On the surface, nothing about the West Virginia family in "Lark and Termite" seems especially noteworthy, except perhaps the consistency of their misfortune, but the author reveals their tangled secrets in such a profound and intimate way that these ordinary, wounded people become both tragic and magnificent. Phillips's story is inspired by the alleged No Gun Ri massacre, which was the subject of the Associated Press's controversial Pulitzer Prize-winning exposé in 2000, but there's nothing polemic about her riveting portrayal of that event. She's interested only in the waste of war and the heroism of young Cpl. Leavitt, who continues caring for the doomed refugees despite his own injuries. "He sees that war never ends," she writes. "It's all one war despite players or location, war that sleeps dormant for years or months, then erupts and lifts its flaming head to find regimes changed, topography altered, weaponry recast." Knowing what transpired at No Gun Ri saps none of the suspense from this gripping scene because Phillips keeps a tight focus on Leavitt's interaction with a young Korean girl and her blind brother. As the three of them struggle to survive, Leavitt's thoughts drift back to the vibrant bar singer he married just before shipping out, and he senses, correctly, that she's giving birth to a son in the States on this very day. Through that mesmerizing war tale is woven the other story, set in West Virginia in 1959. Leavitt's now 9-year-old son, nicknamed Termite, is severely physically and mentally handicapped, unable to speak or walk. He's cared for by his tireless aunt and his devoted 17-year-old half-sister, Lark. Phillips narrates in each of these three characters' voices, carefully revealing the complicated, sad history of their makeshift family. Lark is determined to care for her half-brother no matter how that burden might constrain her own life. She never accepts the discouraging diagnoses about his mental perceptions, and she realizes that he's all she has left of her vanished mother. "From the time I was a kid," she says, "I thought his head was heavy because there was so much in it he couldn't tell or say. That everything had stayed in him, whether he recognized the pictures or not. That he'd kept all the words I couldn't call up, our mother's words and words about her. Words from before we were born, what I heard until I was three and forgot." Lark's aunt, a single woman with no kids of her own, is doing the best she can by her sister's children, but past betrayals have made her wary of accepting help from anyone, even her hardworking boyfriend, who seems willing to wait forever to regain her trust. But she's more concerned with the problem of giving Lark a normal life while keeping Termite from being institutionalized. A nosey social worker keeps poking around, offering helpful advice and a new wheelchair, but the aunt is deeply suspicious. In the novel's most surreal and lyrical sections, Termite describes the patchwork of sounds, images and meanings trapped in his inert body. All this takes place as a violent storm threatens to flood the town, a calamity that eventually brings long-buried secrets to the surface and washes away the family's tenuous structure. I know it sounds like too much is going on in Lark and Termite, but these disparate elements resonate with each other in a most captivating manner. It's confusing only in the way anything truly profound can be. On one level, Phillips is writing a kind of family mystery, and the slowly interconnecting revelations about how Lark and Termite ended up in their aunt's care are thoroughly engrossing, charged with pathos and a surprising degree of eroticism. At another level, though, Phillips is doing something strange and mystical. There's a subtle sympathy between the Korean War story and the events that take place exactly nine years later. Haunting echoes and repetitions overcome the differences in time and place: The Korean girl and her blind brother whom Leavitt tries to save display an uncanny resemblance to Lark and Termite; the threat bearing down on the refugees in the tunnel is a striking reflection of the storm about to destroy Winfield, W.Va.; and in both worlds, self-sacrificing compassion manages to overcome the barriers imposed by cruelty or language or even death. This isn't merely a matter of stylistic experimentation, a kind of Appalachian magical realism. With her striking mixture of hallucinatory poetry and gritty realism, Phillips is trying to articulate the transcendence of love, the sort of unity among deeply devoted people that reverberates beneath the rational world. As the novel moves toward a crescendo of harrowing revelations and brutal confrontations, Phillips surprises us again with another disorienting touch of mysticism and a finale that mingles despair and triumph, naiveté and spiritual insight, a startling demonstration of "how lightning fast things can go right or wrong." A pretty awesome book, all told... There's an awful lot of beautiful writing in this book, and its not merely limited to those sections that capture the POV of Termite, who is sort of the Benjy or this books attempt to rewrite Sound and the Fury. I'm not sure it's as worked out as S and F, which is fine by me-- the drifting prose style seems less to change from character to character than to be more or less present-- but the writing is frightfully pretty, and in some cases reminded me as much of A pretty awesome book, all told... There's an awful lot of beautiful writing in this book, and its not merely limited to those sections that capture the POV of Termite, who is sort of the Benjy or this books attempt to rewrite Sound and the Fury. I'm not sure it's as worked out as S and F, which is fine by me-- the drifting prose style seems less to change from character to character than to be more or less present-- but the writing is frightfully pretty, and in some cases reminded me as much of Janet Kauffman as it did of Faulkner. It's a relatively great story, too, though I think the ending of it is a little off-- not the very end, I guess, but the climactic flood. I think the problem here for me at least is that Philips hasn't quite worked out how to tell plotted sections like these using the voice that she uses for more prosaic moments-- there are times in the flood scenes when it feels like the writing is much more pedestrian, because we need to understand something for the plot to move forward, and it creates the odd sense that the story and the language used to tell it aren't quite in sync. There's also a kind of clear-the-decks momentum in that section that feels a little arbitrary. A lot happens on that "crazy night," and it sort of disrupts the overall ease and stasis that I, for one, found really appealing. Told alternately from the perspective of Lark, a young girl in rural West Virginia, and Robert Leavitt, a young soldier in South Korea in 1950s, and occasionally from Lark's brother, Termite, a young disabled boy. The care of Termite often falls to Lark, although there is more of a sense of the two being joined at the hip than Lark resenting the "chore" of looking after Termite. 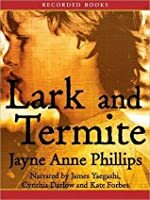 I wasn't familiar with Jayne Anne Phillips prior to reading Lark and Termite, but I now plan on reading more of her. T Told alternately from the perspective of Lark, a young girl in rural West Virginia, and Robert Leavitt, a young soldier in South Korea in 1950s, and occasionally from Lark's brother, Termite, a young disabled boy. The care of Termite often falls to Lark, although there is more of a sense of the two being joined at the hip than Lark resenting the "chore" of looking after Termite. The beginning is a slow immersion into the characters' stories, and it took me longer than usual to begin to connect and care about them, but Phillips writing is lovely. She made everything and everyone still feel very familiar, as though at the very essence of each person there was something so clearly a part of yourself to identify with, to hold onto that character. I loved the passages in Termite's voice, Sergeant Robert Leavitt's story was both haunting from the Korean conflict perspective and his passages during the time in the tunnel. I loved the voice of Lark, although some of her experiences made me cringe, and others just made me cry. I liked the structure of this book, the way the story evolves in successive tellings by Termite's father, Corp. Robert Leavitt, in Korea in 1950, and by young Lark, in 1959, as well as by Lark's aunt, Nonie, Termite himself, and finally Lark and Termite's mother, Lola. It's a complicated family story that Lark only unravels at the end. But despite the period details, the strongly drawn characters and the evocative atmosphere, the story didn't really get going for me until about two thirds of the I liked the structure of this book, the way the story evolves in successive tellings by Termite's father, Corp. Robert Leavitt, in Korea in 1950, and by young Lark, in 1959, as well as by Lark's aunt, Nonie, Termite himself, and finally Lark and Termite's mother, Lola. It's a complicated family story that Lark only unravels at the end. But despite the period details, the strongly drawn characters and the evocative atmosphere, the story didn't really get going for me until about two thirds of the way through, when I realized that not only were we going to find out what happens to Lark and Termite, but we were also going to find out what happened in 1950, by which time I couldn't put the book down! This is one of those books where the starred ratings don't really work for me. There are many things to appreciate in this book. The writing is phenomenal. The structure is fascinating. There are many things about it that would be great to discuss in a book club. But...I didn't love reading it. As technically lovely as it was, it never really captivated me. The story centers around Lark, a teenage girl in 1950s West Virginia, and her younger half brother, Termite. Termite doesn't speak or walk, a This is one of those books where the starred ratings don't really work for me. There are many things to appreciate in this book. The writing is phenomenal. The structure is fascinating. There are many things about it that would be great to discuss in a book club. But...I didn't love reading it. As technically lovely as it was, it never really captivated me. The story centers around Lark, a teenage girl in 1950s West Virginia, and her younger half brother, Termite. Termite doesn't speak or walk, and Lark is in charge of his care. Their story is told through the overlapping voices of multiple characters. I admit to being a reader who loves a good plot, and this book is more of a portrait of the idea of devotion. Parts of the book are way too slow for me. But then, when the action does kick in at the end, I don't really believe it. Long on the tbr list, I read this never expecting the drama, the sadness, the overwhelming twists. It was a bit overwhelming for me. This is a story that packs a punch -- a nasty one. This is a tale of love, of loss, of birth and death, of the Korean war and it's brutality. Termite, a baby born with disabilities to a father, (Leavitt) fighting in Korea, hoping and praying to return to his bride Lola who is carrying Termite when Leavitt leaves for the war. Lark is also a child of Lola, father unkn Long on the tbr list, I read this never expecting the drama, the sadness, the overwhelming twists. It was a bit overwhelming for me. This is a story that packs a punch -- a nasty one. This is a tale of love, of loss, of birth and death, of the Korean war and it's brutality. Termite, a baby born with disabilities to a father, (Leavitt) fighting in Korea, hoping and praying to return to his bride Lola who is carrying Termite when Leavitt leaves for the war. Lark is also a child of Lola, father unknown till the end of the book. Both are left with Lola's sister to raise in poverty in West Virginia. Replete with never ending sadness, I found this book to be too heavy. I finished it, but don't like the haunting feeling and wonderment of the need to be overbearingly intense. A promising start. It didn't fully engage me, but it pre-engaged me. Enough to trudge on with Corporal Robert Leavitt through Korean villages, as memories of his pregnant wife, Lola, flooded him. There were even flavors of Tim O'Brien and Mailer--a hint, a possibility, a soft lure. As Leavitt advanced with the story, it began to get soggy. And I am not referring to the terrain in Korea. Rather than some critics' accolades describing the novel as "elegant and mystical," I experienced it as rather A promising start. It didn't fully engage me, but it pre-engaged me. Enough to trudge on with Corporal Robert Leavitt through Korean villages, as memories of his pregnant wife, Lola, flooded him. There were even flavors of Tim O'Brien and Mailer--a hint, a possibility, a soft lure. As Leavitt advanced with the story, it began to get soggy. And I am not referring to the terrain in Korea. Rather than some critics' accolades describing the novel as "elegant and mystical," I experienced it as rather inelegant, clumsy, and sophomoric. I saw what the author was ineffectively striving for--a non-linear, somewhat experimental approach of contrasts and abstractions laced with a mythical atmosphere. But it was weak (yet wordy), prosaic, with a blurry tone and thorough lack of either irony or dramatic amplitude. It came off as authorial self-regard. It was stale, not ripe, and static, not dynamic, but rife with stilted prose and mixed metaphors tossed in at the oddest times. Additionally, the voice of Termite, a child afflicted with hydrocephaly and features of autism, was over-precious, mawkish, and heavy-handed. What struck me was the novice writing of his interior dialogue/feelings/thoughts. It was distracting and clunky and utterly lacked the soul that the author strained ineffectively to express. Sometimes implication and sublimity is more effective to describe remote characteristics, but the author used exposition and dull images that did not congeal. I could not get away from the contrivance of the author's writing. Phillips was taking stabs at erudition that were not edifying or convincing; rather, it reached me with a resounding thud. It was as if she were saying, "Look how discordantly confounding I can be!" The tone was not evocative; instead, it was gummy and synthetic. A minor irritation--children with Termite's afflictions tend to be "tactile defensive"--i.e. they would not have tolerated the pattering of rain against their skin as Phillips had him seek. She either did not research Termite's handicaps or chose to ignore it. "Lola's the cat", the author writes. Another prosaic metaphor. Or was it a clawing attempt at enigmatic hyperbole? Well, Lola may be the cat. But this story is a dog. With fleas. I love characters like Lark. Young females who are smart and thoughtful and deeply interesting on the inside and come across as either timid or strange on the outside. Lark reminds me of Francie (A Tree Grows in Brooklyn) or several McCullers characters (Frankie in The Member of the Wedding, Mick in The Heart is a Lonely Hunter). Characters like these remind me of myself in some ways - not their experiences, but the ways they think and what's important to them. Stylistically, this book is stunni I love characters like Lark. Young females who are smart and thoughtful and deeply interesting on the inside and come across as either timid or strange on the outside. Lark reminds me of Francie (A Tree Grows in Brooklyn) or several McCullers characters (Frankie in The Member of the Wedding, Mick in The Heart is a Lonely Hunter). Characters like these remind me of myself in some ways - not their experiences, but the ways they think and what's important to them. Stylistically, this book is stunning. The multiple perspectives is extremely well-done. Way better than, say, Barbara Kingsolver's Prodigal Summer. I love too the way the plot inches along over the span of just a few days. Phillips takes us inside the characters rather than worrying about plot - reminds me of Marilynne Robinson. The language is also really well-done most of the time. It's extremely vivid and poetic, though there were a few moments in the beginning that seemed a little over-written. My only complaint about this book is Stamble. I love magical realism, but Stamble wasn't it. Termite's hearing ability and his seeing what Leavitt sees was magical realism and great, but Stamble wasn't because Lark and Termite are the only ones who see him. I wished that he was either real or was not real but everyone saw him. The way that he sort of became a ghost turned me off and didn't seem to fit into the novel at all. I have this feeling that "beautifully written" really means that I can't understand it without the aid of a read-between-the-lines-ist. The general story line is clear enough, but the feelings or thoughts of the characters were often expressed in some form of prose like a Joni Mitchell song. I have a sense of your mood here, but what? What did you just say? There's the mood about how everyone loves Termite so much, but why, really? Tell me so I get it. I don't walk away from this loving him. The I have this feeling that "beautifully written" really means that I can't understand it without the aid of a read-between-the-lines-ist. There's a sense of Nonie's resolve and her commitment and dedication, but why doesn't she just make a go of things with Charlie? There's so much that I just didn't quite grok. Perhaps a few weeks with an English teacher would improve my opinion, but as it stands, my opinion is that the characters never got real enough for me and that the story itself was sluggish. This review is for the audiobook version. A book full of very interesting characters and all in all a very compelling story. I wasn't sure what to make of the many meanders it takes to get there; the scenes in the voice of Termite and those in the voice of Robert while injured and hallucinating are I guess what stopped many reviewers from finishing the book. They certainly weren't my favorite parts but they also weren't meaningless, with many little clues if one listened carefully. Lark was a lo This review is for the audiobook version. A book full of very interesting characters and all in all a very compelling story. I wasn't sure what to make of the many meanders it takes to get there; the scenes in the voice of Termite and those in the voice of Robert while injured and hallucinating are I guess what stopped many reviewers from finishing the book. They certainly weren't my favorite parts but they also weren't meaningless, with many little clues if one listened carefully. Lark was a lovely character, well written and eminently likeable. This is Jackie's book club pick. This book apparently won several awards. The author was lauded in NPR interviews on Fresh Air with Maureen Corrigan and Weekend Edition with Liane Hansen. This book also got great reviews from The New Yorker, The New York Times, and the Washington Post. I must be missing something. Except for an excerpt on p.56 which explains the love rectangle among the main characters--Charlie & Nonie, Nonie & Onslow, Onslow & Lola, Lola & Charlie--the whole firs This is Jackie's book club pick. I must be missing something. Except for an excerpt on p.56 which explains the love rectangle among the main characters--Charlie & Nonie, Nonie & Onslow, Onslow & Lola, Lola & Charlie--the whole first 175 pages could be deleted. The story yammers. Yammer, yammer, yammer. The action starts on p.176 with the flood, and I feel that most of the book up to that point, while poetic, is annoying. The story of the flood feels like an allegory of the flood of truth Lark finds in the birth certificates. The aftermath and resolution are unbelievable, but at least it's interesting. I mentioned this to my son, Robert, and told him that reading this book felt like homework. He suggested I look for SparkNotes. He said that while SparkNotes might spoil the plot, at least you know what you're looking for. Interesting. It made me think that I couldn't be the only one who felt that this book was a slog. So I went in search of a review that summed up how I felt about this book. I found it on BookBrowse.com, in an article written by Kim Kovacs, who says, "...much of Phillips' writing is simply beautiful. There are sections that are positively beautiful..." I agree. On p.42, Lark says of Stamble, "He means well...I can smell it on him like a hint." Lark describes what it's like to grow up, "All my collections are just sitting there. They're all things I used to want, and I can't tell why I did." (p.38). And later, Leavitt says, "Scared kids with weaponry do evil things..." (p.71). So true. Kim Kovacs goes on to say, "Unfortunately, Phillips writing frequently shifts from dazzling to incomprehensible. The style becomes overly distracting, limiting the reader's ability to relax and enjoy the novel. As each character narrates his or her point of view, their perspectives shift between present and past, with few clues indicating events happened at different times. At some points the narrative is first person, at others it's third person. Sentences are inconsistently italicized, sometimes to indicate the past, sometimes emphasizing another train of thought, further confusing matters. The book's parallels and symbolism are clumsy and...contrived. Finally, some of the plot elements are overly theatrical and, in this reviewer's opinion, nonsensical." You think? Solly leaping onto a moving train on a Harley? The Weekend Edition article says that thirty years ago, while visiting a friend in West Virginia, author Jayne Anne Phillips spotted a boy sitting in a metal chair in an alley. He stayed there for hours, holding a thin blue strip from a dry cleaning bag. That explains the inspiration for Termite. Once Phillips started writing, the 1999 AP story broke about No Gun Ri. She was inspired by that awful incident and cover-up, and decided to include it in her book. That explains the chapters narrated by Corporal Robert Leavitt. This book has gotten attention for voicing the thoughts of speech-disabled persons, as evidenced by the acknowledgements in the back of the book. It has also been compared to William Faulkner's, "The Sound and the Fury." However, I just don't see it. Kim Kovacs finishes by saying, "Some readers may find the moments of luminescent writing enough to justify their perusal of this novel. I suspect that most, however will find the flaws overwhelming." I'm in the latter camp. There's just not enough dazzling to justify the incomprehensible. There are few contemporary American authors I look forward to reading quite as much as I do new novel by Jayne Anne Phillips (even when her latest sits in the to-read pile for an awfully long time), and the decade or so between the marvellous Motherkind and this has been well worth it; she is the queen of contemporary Southern Literary Gothic, a Flannery O’Connor/Carson McCullers/Eudora Welty/Harper Lee for the new millennium. As with each of these fine practitioners of Southern Gothic, she does There are few contemporary American authors I look forward to reading quite as much as I do new novel by Jayne Anne Phillips (even when her latest sits in the to-read pile for an awfully long time), and the decade or so between the marvellous Motherkind and this has been well worth it; she is the queen of contemporary Southern Literary Gothic, a Flannery O’Connor/Carson McCullers/Eudora Welty/Harper Lee for the new millennium. As with each of these fine practitioners of Southern Gothic, she does small towns and children superbly and in a way that is just on the edge of unsettling. Lark, at 17, attends Barker’s Secretarial School above the Five and Ten Cent Store in Winfield, West Virginia; it is mid summer in 1959 and Winfield is no longer the town is was. Lark’s learning is fitted in around caring for Termite, her 9 year old brother with encephalitis, whose major interest seems to the music without words, strips of blue shopping bags that flutter in the wind and an astounding ability to hear. If nothing else, this love story of living with a disabled dependent is worth the book – it is beautiful, elegant and sympathetic without ever being patronising or mawkish. Lark and Termite live with their aunt, Nonie, who works in Charlie Fitzgerald’s diner in town; across the alley in their not-so-well-off neighbourhood is Nick Tucci and his sons. Along with Nonie’s friend Elise, Charlie’s mother Gladdy, the mysterious Mr Stamble from Social Services – these are the book’s characters, joined by Lola, Lark's & Termite's mother, and Robert, Termite’s killed-in-Korea father. This is small town, late ‘50s southern marginally-poor white – just the people for a fine piece of Southern Gothic. This is I think Phillips’ most poetic novel – the language is dreamy, from the slightly surreal disconnected parts of Termite’s narrative to the wounded Robert’s drift into pain and delusion in a South Korean tunnel to Lark’s optimistic realism and Nonie’s pragmatically romantic voice, always in the now shaped by the past. In alternating authorial voices these four tell the story, keep us teetering on the brink of the grotesque (as every good piece of Gothic writing should) and manage the limitations of the now – limitations that are class specific, gender inflected and framed by the possibilities and potentialities of sacrifice. The few days of the novel – 26-31 July 1959, and Robert’s three days of battle in July 1950 – are where everything changes, in part because Lark summons up the courage to explore her mother’s past, and there is the possibility of something new. But there is another way to read the novel, not with Lark on the verge of adulthood and Termite struggling to make sense of their new opportunities, but as the effects of war, of the battles that never end because soldiers get left behind and damaged people remain at home after the soldiers are lost. This is as much the story of the effects of Robert’s death, of Lola’s beauty, her damaged psyche and her adoration of her sister. Loss, in Robert’s case senseless, and sacrifice, of family, happiness, affection, all the while woven through with yearning and desire (which Phillips achieves without falling into psychoanalytic traps) shape and frame this story. This frame then delimits the story to its particular case while providing it with its link to its context – it is a barrier and bridge allowing us to see the general in the specific. I am just slightly awed by Philllips’ craft. This is not, however, a novel that is going to surrender its story easily. The narrative, the back-story that makes the now so powerful, emerges spasmodically; none of the characters surrenders their life to us as readers without hesitation, reticence – these are deeply private and painful tales being told – and with at times the horror of what we’re finding out being mitigated by the poetic timbre of the text. This means that it is not an easy read (I picked it up and started several times in the four years it sat on my to-be-read shelf before I got the voice) but it is a read to savour. "Lark and Termite" follows two storylines that connect in ways the participants will never see. The story takes place in the 1950s and focuses on Lark, a young woman on the verge of adulthood Our connections with others are sometimes obvious, but often we are influenced by people we are not aware of or with whom we see little connection. It is as if absence can be a stronger connector than presence, and in the hands of Jayne Anne Phillips, we find those connectors, not just in people but events. "Lark and Termite" follows two storylines that connect in ways the participants will never see. The story takes place in the 1950s and focuses on Lark, a young woman on the verge of adulthood, and her younger stepbrother, Termite, who is unable to speak or walk. Their mother is the absent Lola, but they are raised by a loving aunt, Nonie, who works at a "greasy spoon" owned by the man she loves but will not commit to. The other story is of Termite's father, Corporal Robert Leavitt, a soldier in Korea who does not live to see the birth of his child. The absence of these parents is as palatable as the presence of those who love and support Lark and Termite. Lark's birth father is unknown to her and we are not sure what Termite understands. Phillips tells the story through the voices of the different characters, and through Termite, we see a world of wonder and joy. However, his voice is the weakest in the novel not because of the character, but because Phillips lets his voice slip out of character too often. But that is a rare slip in this otherwise strong novel. In fact, Phillips excels in giving an authentic voice to these West Virginian people struggling to make it day to day. They are poor, but they do not focus on their poverty as much as each other. Nonie takes these children in with no complaint and Lark takes care of Termite since he is more comfortable with her than at school. The neighbors are a father and sons abandoned by their wife and mother; they are a hardscrabble lot but they make sure that Lark, Termite, and Nonie are also taken care of. There are no saintly figures in this novel, but there are real people who make mistakes, care for others, and focus on the next day. For Lark and Termite, the community is very present and generally supportive. But that does not mean Lark never wonders about her absent mother and her unknown father. And for the scenes in Korea, as Leavitt fights for his life, it is with the absence of his wife and the presence of a young girl trying to care for him. We are changed by those with us as well as those far away. Phillips bounces between Leavitt's story in Korea and Lark's in West Virginia, and neither one knows the impact they have had on each other even though they never met. Their connection is Lola, and she is absent from both of them at crucial times. First, the good stuff: I love the rotating points of view and hearing about things from different characters' perspectives. And one of these POVs is that of a severely developmentally disabled boy. I haven't seen this pulled off quite the same way. I thought, for the most part, it really worked. It didn't feel gimmicky to me, and I thought the author used this character's vantage point to cleverly reveal important facts to us. I also liked the interwoven lives of these characters, despite the gap in time between one of them and the rest of them (you'll understand what I'm talking about when you read it). And the author's writing is a joy to read - extremely sensory (I could smell and hear what was going on). Downright gritty at times (in a good way). Interesting characters. Intriguing plot points that keep you wondering. Really, really good. As for the problems, I thought the parallels between the children that Leavitt encounters in Korea and the title characters was unnecessarily obvious, and I thought at times, the author got bogged down in description that didn't add to the experience of reading the book. Other than that, just lovely. Jayne Anne Phillips is an American novelist and short story writer. Phillips graduated from West Virginia University, earning a B.A. in 1974, and later graduated from the Iowa Writers' Workshop at the University of Iowa. Phillips has held teaching positions at several colleges and universities, including Harvard University, Williams College, and Boston University. She is currently Professor of Engl Jayne Anne Phillips is an American novelist and short story writer. Phillips graduated from West Virginia University, earning a B.A. in 1974, and later graduated from the Iowa Writers' Workshop at the University of Iowa. Phillips has held teaching positions at several colleges and universities, including Harvard University, Williams College, and Boston University. She is currently Professor of English and Founder/Director of the Rutgers-Newark Master of Fine Arts in Creative Writing Program. In 1976, Truck Press published her first short story collection Sweethearts, for which Phillips earned a Pushcart Prize. Lark & Termite, her fourth novel, published in 2009, was selected as one of five finalists for the National Book Award in fiction. Phillips' works have been translated and published in twelve foreign languages. She is the recipient of a Guggenheim Fellowship, two National Endowment for the Arts Fellowships, and a Bunting Fellowship from the Bunting Institute of Radcliffe College.